If you are in the market for a new refrigerator, you should consider one with a bottom freezer. Bottom freezer refrigerators are a more modern and contemporary home appliance compared to the traditional style refrigerators. Coming in style variation such as French doors and providing more shelving space. The fridge sits right at eye level, allowing proper storage for frozen goods underneath. This storage option keeps food organized and easily accessible compared to the traditional fridge. This combined makes a bottom freezer refrigerator a more stylish and modern choice for your forever home. To start us off, let's cover what you're getting into with some frequently asked questions about these bottom freezer refrigerators. Each bottom freezer refrigerator has its own unique set of specs that we will cover in each fridge's overview. What are bottom freezer refrigerators? These refrigerators take the traditional refrigerator and flip it upside-down, giving you the freezer on the bottom instead of the top. What makes them better than traditional refrigerators? Aside from the freezer, the fridge sits just at eye level, making storage more convenient and accessible. Instead of trying not to spill and stack frozen goods, you can place them inside of a frozen drawer. That makes storage more straightforward and more organized, it also helps reduce the number of spills and dropping that could take place from a high freezer. Bottom freezer refrigerators also seem to come with more shelving and storage spaces, instead of just being one big space. The most common retailers are usually online since they have the most stock available. 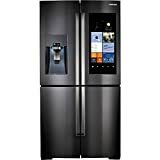 Websites such as Amazon, Lowes.com, and Sears.com sell these fridges. However, you may also be able to find them in store at Lowes, Sears, and Walmart. If not, the store can always order it for you. No need to go out searching, we will provide plenty of retailer links along with each fridge. With traditional style fridges coming in around $500, bottom freezer fridges may seem high; but you get what you pay for, with convenience and style, along with plenty of higher specs and upgrades, the prices aren't so ridiculous. The lowest bargain prices sit around $1,000, where average models seem to go for $1,200 to $1,700. 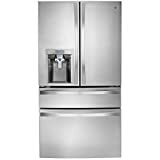 This price is depending on the style and smart home features that come with the bottom freezer refrigerator. 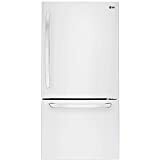 The majority of bottom freezer refrigerators come in at around $2,500, which is a reasonable price for those looking for good quality and spacious interior. Fancier bottom freezer refrigerators can go as high as $4,000 to $6,000. These include more specs and even more storage than their lower-priced counterparts. Of course, purchasing and testing every bottom freezer refrigerator is impossible. Therefore, many review sites and articles are being read and reviewed in your best interest. That allows us to bring you a list of the highest reviewed bottom freezer refrigerators on the market for 2018. We took into careful consideration of price range and average customer reviews on each retailer site. That allows for accurate depictions of each bottom freezer refrigerator. In no particular order, we will be covering the specs, prices, and retailers of the top 10 bottom freezer refrigerators that you can own in 2018. This refrigerator has 22.1 cubic feet (15.6 cubic feet for the fridge compartment), so, you're getting a good amount of storage. In the fridge compartment, you get three interior shelves, two of which are adjustable, and two crisper drawers. Along with six barred cubbies on the door, organization comes easily. The freezer has 6.5 cubic feet of storage with an ice maker built in the compartment. It comes in black, but it is also available in stainless steel for $100 more. This bottom freezer refrigerator is much fancier than the Whirlpool and comes with French doors and more storage compartments on the inside. 26.8 cubic feet make up this fridge (18.6 going to the fridge compartment), allowing more room than the whirlpool. In the fridge compartment, you get three shelves, two crispers, and a pantry door. With also three shelves on each door. The freezer contains two storage units inside. The ice maker and auto-fill water dispenser with touch controls are all provided within the door. A stainless steel model is available for the same price, instead of charging $100 more like the whirlpool. Price is available at Check on Amazon on Amazon. With four French doors, this bottom freezer refrigerator seems like it would have more room than most. However, the Kenmore only sits at 21.1 cubic feet (17.3 inside the fridge). This makes it a smaller fridge. It has three shelves, two crispers, and three cubbies on each door, and allows for decent organization. The Kenmore also has a pantry drawer, and this sits above the freezer in a separate unit instead of inside the fridge. The pantry has three sections, and the freezer has two storage compartments. The water and ice are held in the door. This average looking bottom freezer refrigerator comes with 24.1 cubic feet of storage (16.4 going to the fridge compartment). That puts it pretty up there for storage and organization, but still not as much as the GE fridges. The fridge houses three shelves, two crispers, a pantry, and four cubbies on the door. The freezer has two spaces, but there is no water or ice dispenser in the fridge. This beautifully modern bottom freezer refrigerator comes with four French doors and even a built-in water pitcher. Though, you only get 22.6 cubic feet of storage (12.9 in the fridge compartment). This refrigerator has three shelves, two crispers, a separate pantry drawer above the freezer, and seven cubbies on the doors. The freezer has two spaces for storage, and the fridge comes with an auto-filling water pitcher. Along with a water and ice dispenser on the outside of the doors. This fridge also received considerable marks in how well the temperature maintained over the course of 24 hours where the others fell short. This fridge takes your smart home to a new level, but for a hefty price. With a 21.5 inch touchscreen on the front of the refrigerator, you'll be living in the future. This French four-door fridge clocks in at 27.9 cubic feet (16.4 for the fridge and a whopping 11.5 for the freezer). With three shelves, two crispers, and six door cubbies, the refrigerator seems pretty standard. However, the freezer contains seven shelves and six door cubbies, making this the most massive freezer by far. The touchscreen comes with preloaded apps that you cannot delete or add to the list. The most interesting app is the one that lets you see inside the fridge without even opening it. This fridge is available at Check on Amazon on Amazon. This is one of the biggest fridges with 30 cubic feet (17.3 going to the refrigerator and 3.8 for the CustomChill pantry drawer). The ice maker is housed in the entirety of the left door, making that door run colder than the other. Inside, you get three shelves, three crispers, and six door cubbies. The pantry drawer has three spaces, and the freezer has two. The only bad thing about the fridge is that it runs a little warm. However, the freezer holds its temperature pretty well. The storage spaces are more spacious than each of the refrigerators before this one, making this fridge the most open for storage. This crazy fridge has a Keurig inside of it, earning it the title of Cafe Series. This French door system has water, hot water, ice, and coffee dispenser at the ready. Conversely, this bottom freezer refrigerator is only 27.8 cubic feet. It's much bigger than the cheaper ones but smaller than some of the pricier ones we've reviewed so far. It also has the average three shelves and two crispers, with the pantry underneath. The doors have seven cubbies, though space is limited due to the room the Cafe center takes up in the left door. The freezer is left with the standard two compartments. GE CFE28USHSS is available at on Amazon. This French door fridge offers the food showcase door-in-a-door feature adds 3.8 cubic feet. That doesn't do very much besides adding more organization and storage. The bottom freezer refrigerator holds 27.8 cubic feet of room (15.7 in the fridge space). However, the ice maker takes up a bit of space in the door. Inside, you get the basic three shelves and two crispers. This fridge's pantry drawer is quite more spacious than the others, and the freezer is split into the average two compartments. Other than that, this fridge is a reasonably basic fridge compared to the others and is an excellent modern touch to any kitchen. This fridge is the largest on this list, coming up at 34.3 cubic feet, designating 19 of that to the fridge. This giant bottom freezer refrigerator earned its title as the Chef Collection. With four French doors, you better feel like a chef. Even though the entire bottom is a freezer, the right side can be turned into a fridge compartment with a touch of a button. This comes in handy if you have more refrigerated items than frozen items. This fridge also comes with two stainless steel Chef pans that slide under the fridge shelving. There's a "Chef Basket" inside for grated cheese and sliced veggies, a large "Chef Pantry," and even a SodaStream in the door for sparkling water. Currently part of a limited collection and very high in demand. Saumsung RF34H9960S4 is priced at Out of stock and is available on Amazon. There are so many amazing fridges to choose from, but most people only have one in their homes. 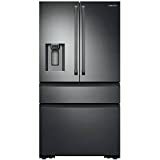 The bottom freezer refrigerator, on our list that is most worth its price is the Samsung RF23M8090SG model. Not just because it contains a transportable water pitcher, but because it comes with average spacing for a decent amount. It also has the best reviews on how well it stays cool and maintains a constant cold temperature. Of course, for a family splurge, the Samsung Family Hub is also an enticing choice for its fancy touchscreen that makes it unique. If this is a starter bottom-freezer refrigerator, you should look over the fancy add-ons. It is best to go for a fridge that has a consistent cooling temperature like the Samsung RF23. Though, the Whirlpool has gotten good reviews on being a decent starter model for those just getting a family home together. However, most people have their own opinions, especially on something that should match the interior of their home and the size of their family. If you aren't entirely falling in love with any of these highly reviewed fridges, try looking at company sites with high reviews. For instance, Samsung and LG have some of the best bottom freezer refrigerators. That makes them highly reputable when shopping for your new bottom freezer refrigerator. Through looking for the best reviews, the Kenmore fridge seemed to have a high amount of sponsorship on nearly every site visited. However, it is not at the top of our list. Let us know what your favorite bottom freezer fridge is in the comments below or you can also pick from the Best Frigidaire Upright Freezer.